Are coin collectors more gullible than most? Sometimes it seems that way to me because there are so many apocryphal stories that seem to be accepted as absolute truth when a little bit of thought would cast doubt or even expose utter fabrication. Such is the case with the stories attached to this Civil War era token. One of the best-known and commonly struck types were store cards known as "Lindenmueller tokens," named for New York barkeep Gustavus Lindenmueller. In 1863, Lindenmueller had more than one million of his one-cent tokens struck and placed into circulation. One of the common uses for the token was for streetcar fare. The Third Avenue Railroad company of New York, which had willingly accepted a large quantity of the Lindenmueller tokens in lieu of actual currency, asked Lindenmueller to redeem them. He refused, and the railroad had no legal recourse. Incidents such as these eventually forced the government to intervene. On April 22, 1864, Congress enacted the Coinage Act of 1864. While the act is most remembered for the introduction of the phrase "In God We Trust" on the newly created two-cent piece, it also effectively ended the usage of Civil War tokens. First off we are told that this is a one cent token. That's extremely unlikely for two reasons. One, it's too big, as small cents had been in use since 1857. It's roughly quarter sized: larger than the small cents, larger than the two cent, but smaller than the old large cents. Second, it is plainly a beer token - apparently good for a mug of beer at Lindenmueller's establishment. 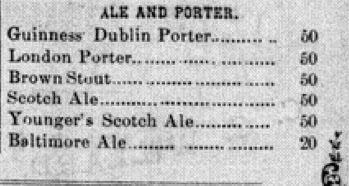 I couldn't find what a glass of beer there might have cost in 1863, but I did find this 1866 menu at the Library of Congress and it shows a price of 50 cents in Washington DC. Prices may have been higher there (it may have been an upscale restaurant), but probably not fifty times higher. My guess is that beer probably cost at least a nickel or so and that was the nominal value of this token. Next, we are told that it was used for streetcar fare. That may be, but again, did that cost one cent? Google didn't help me, although I did find a reference to it costing a nickel in 1888 San Francisco. But that's not what really bothers me about that part of the story. The big whopper is the bit about "Incidents such as these eventually forced the government to intervene." There is absolutely nothing on that token that indicates any value and it does not look like any coin of the United States, penny, two cent or even nickel. There certainly are other tokens of the time that do look like circulating coins, but this one does not, so I'd doubt it was the impetus of that law. According to Brother Basil Leo Lee, Discontent in New York City, 1861-1865, The Catholic University of America Press, Washington, DC, 1943, pp. 172, 180, the price of malt liquors in Brooklyn was raised from three to five cents a glass in November 1863. All the leading saloons in New York and Brooklyn raised beer and ale prices to ten cents a glass in July 1864. The fare on the Third Avenue line was five cents in October 1864. Lindenmueller’s advertisement in the New-Yorker Staats-Zeitung for 25 September 1858, p. 5, sets the entry fee for the Odeon at six cents, including a glass of beer; the advertisement for 18 March 1864, p. 6, gives the admission fee as ten cents, with children over six years old admitted for half price and younger children free. There's much more there and I recommend reading all of it. By the way, I added a note to that Wikipedia article, so it may have been edited or even removed by the time you read this. Similar stories can be found around the web, though. Roloff was the die designer. Perhaps he took part of his fee in advertising? Note: All my coins are in a safe deposit box. I keep nothing in my home. Baseball Hall of Fame coins - flash in the pan? What makes a PR69DCAM not a PR70 DCAM? Roll Searchers - what to do with the leftovers? Book Review: Mark Ferguson's "The Dollar of 1804"
Twenty Cent Coins - why?